The critical weakness in many products is the region of joints that exist in the design. Bolted joints in particular can be a source of concern for the Engineer. In spite of the term "nuts and bolts" being used to describe the simplest aspects of a particular topic, bolted joints are far from being simple. They are not easily analyzed and frequently the engineer has to make major assumptions to assess whether the joint is capable of sustaining the forces applied to it. 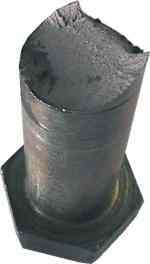 Failure of a single bolted joint can have disastrous consequences for the reliability and safety of the product. It was with this problem in mind that the BOLTCALC program has been devised. The program is designed for ease of use and assists the engineer by automatically entering any standard information such as thread pitch and bolt dimensions as soon as the bolt diameter has been entered. The user can change any data entered automatically by the program. The program runs under the Windows opersting system. The BOLTCALC program completes an analysis of a bolted joint by considering the forces acting upon a single bolt. The program will allow for variations in the bolt clamp force (or preload) due to the tightening method and embedding due to plastic deformation in the thread and under the nut. Based upon published research information, the program will determine the fatigue endurance limit of the thread (rolled or machine cut), the amount of embedding anticipated in the joint and the tightening torque for given friction conditions. A database of thread and under nut friction values for a range of bolt finishes and joint materials is included in the program. 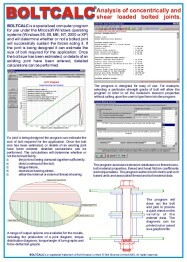 By pulling together published research information in an easy to use package, the program allows the engineer to perform checks and calculations on a bolted joint that otherwise could only be completed after extensive research and experience into the subject. The importance of a bolt's clamp force (the preload) in ensuring that a reliable joint is achieved is often underestimated. The clamp force prevents gaps from occurring at the joint faces. It provides the loading that generates the frictional force between the joint faces to prevent slippage and the load to ensure that any gasket within the joint, seals effectively. Most engineers recognise that a bolt's clamp force is subject to some variability. Research completed in Europe has shown that this variability is largely dependent upon the tightening method used. For example, a greater variation in a bolt's clamp force is to be anticipated when using an impact wrench than when using a torque wrench to tighten the joint. To ensure that a reliable joint is achieved, the BOLTCALC program determines the minimum clamp force that the bolt can be anticipated to generate, after allowing for the scatter due to the tightening method being used. The user selects the tightening method proposed to be used and the program proposes a tightening factor associated with this method. The tightening factor is a measure of the variability of the tightening method and the program uses data, based upon published experimental measurements. By entering a tightening factor of unity, the variability due to the tightening method will be effectively ignored by the program. A great deal of sophistication can be applied to the analysis of structures. Computer based techniques such as the finite element method (FEM) can determine the stresses in almost any part of a structure. However, developing an accurate model of a bolted joint can take a lot of time and effort. The problem is due to the bolt's preload compressing the clamped parts together and to such factors as embedding and preload scatter due to the method of tightening being used. By including these effects in the program, a joint can be analysed in minutes by the program when it would take hours by other methods. The empirical data used by the program, such as embedding losses and bolt fatigue endurance strength, may not be readily available to an engineer. 1. Failure of the bolt to provide sufficient clamp force. The main factor as to whether a bolted joint will sustain the applied forces is will the bolts generate sufficient clamp force or preload? For any application there is a minimum clamping force required to prevent joint failure. The clamping force is required to prevent joint movement being caused as a result of axial and/or shear forces. Both axial and shear forces, acting individually, or simultaneously, can be taken into account, together with any residual clamp force that may be required to maintain a functional requirement such as gasket sealing. 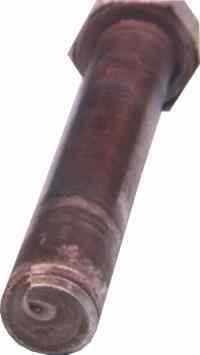 In many instances, when a gap in the joint or slippage occurs, then failure by the bolt loosening or fatigue will occur. When fatigue failure occurs, the cause is frequently insufficient preload rather than poor fatigue strength. 2. The bolt being overloaded by the applied force. If a very high axial force is applied to a joint there is the possibility that the bolt will sustain additional loading that will cause its yield strength to be exceeded. If this does occur then either the bolt will fail due to direct tensile failure, or, when the load is removed, will sustain a plastic deformation that will result in preload loss that could cause the bolt to loosen. The program checks for this possible failure mode and determines a safety factor. For the majority of joints, failure by direct overloading is unlikely because the bolt usually sustains only a small proportion of any force applied to the joint. 3. Fatigue failure of the bolt. All materials have a tendency to fail under repeated loading at a stress level considerably less than the static strength of the material. 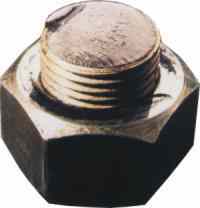 This characteristic of materials is known as fatigue and it is a common cause of failure in many products, including bolts. The program will calculate the alternating stress in the thread of the bolt, based upon the forces entered and the characteristics of the joint. The program will calculate the fatigue strength of the bolt material, based upon the user's selection as to whether the bolt thread was rolled or machine cut. The program uses lower bound, empirically derived values for the fatigue endurance strength. If the user has specific information on the fatigue endurance strength of the bolt being analysed, then this can be used in preference to the program value. If the bearing pressure under the nut face exceeds the compressive yield strength of the joint material, plastic deformation will occur. The preload loss from embedding determined by the program, assumes that the compressive yield strength is not exceeded. If it is, then such preload loss can increase uncontrollably. The program checks that the bearing pressure is within acceptable limits and if it is not, recommends a number of design alternatives. Thread stripping is a shear failure of an internal or external thread that results when the strength of the threaded material is exceeded by the applied forces acting on the thread. 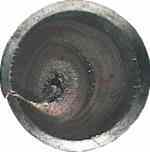 Thread stripping can be a problem in many designs where tapped holes are required in low tensile material. In general terms thread stripping of both the internal and external threads must be avoided if a reliable design is to be achieved. If the bolt breaks on tightening, it is obvious that a replacement is required. Thread stripping tends to be gradual in nature and it may go unnoticed at the time of assembly. It starts at the first engaged thread, deformations causing this thread to carry the highest load; and successively shears off subsequent threads. This may take a number of hours to complete and so the product may appear fine at the time of assembly. The risk is therefore present that threads that are partially failed, and hence defective, may enter service. This may have disastrous consequences on product reliability. The program checks for thread stripping of the internal and external threads.